These delicate sugar cookies are rich and delicious and not too sweet. The cream cheese gives them a little tang but most of the flavor comes from what you top the cookie with. The texture is buttery and crumbly – they would be a true butter cookie if not for the cream cheese. One of the things I love about these is that they are versatile. You can top them with colored sugar, chocolate, nuts, or frosting. I topped some of them with brown sugar and pecans and then drizzled with a little chocolate. The possibilities are endless! They are easy enough to work with that the kids can help. Kyrie had a great time adding colored sugar to a few of the cut outs. Also, these would make great sandwich cookies… The flavor of the cookie is delicate and it would compliment almost any filling. Mix the butter and the cream cheese. Blend in the sugar and flour. Roll out on a floured surface 1/8 inch thick. 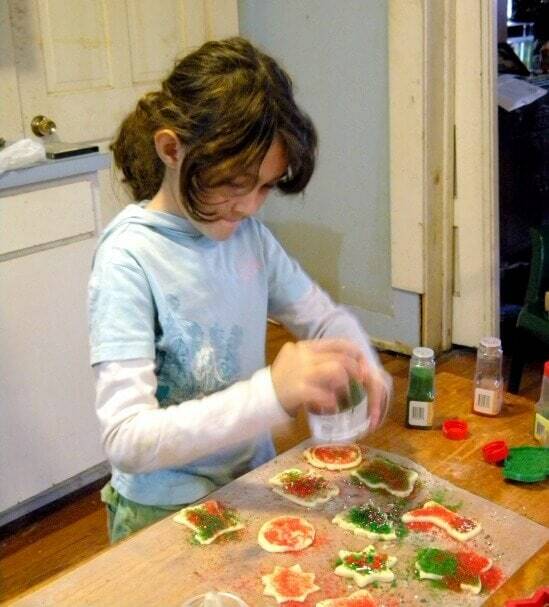 Cut with cookie cutters and add sugar and sprinkles as desired. oOOooOOoooo gonna have to try these….